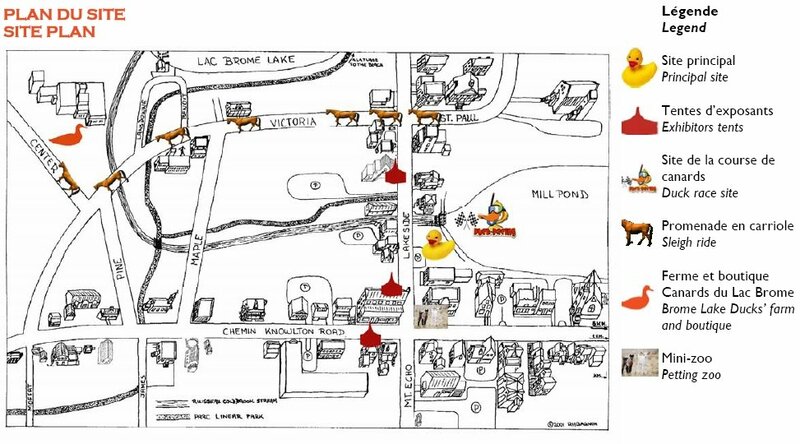 2008 Recap: The weather is looking magnificent for the opening weekend of the Brome Lake Duck Festival. The 8th Annual celebration of fall, ducks and our beautiful town kicks off Saturday morning and runs all this week-end and next weekend featuring music, games, demonstrations and of course the ducks! Knowlton becomes the center of activity in the Townships during the Duck Fest as the colors are breaking into a chorous of reds and oranges and the weather is ideal for being outside with friends and family. The Mill Pond is the place to under the big top but don't forget to stroll around the village and take a peek at our special town! The Canard en Fete festival owes it's success to the hard work of the Chamber of Commerce, countless Volunteers and positive residents, as well as support from The Town and many businesses. Working together has ensured the festival gets better every year with more people attending! The festival is all about discovering new ways to enjoy the Peking Duck that has made Lac Brome famous over the years. The cooking demonstrations are always well attended and the guest chefs creat some wonderful looking dishes! Luckily there are duck sausages available and a steady line-up of folks who needed to bite into a succulant duckydog! The chefs present tips and new ways of preparing duck and explain step by step methods of creating fancy duck recipes with little effort. All the family will be able to go cherish our small farms animals at the petting zoo. Moreover, a sleigh ride of approx. 40 minutes in the village to the duck farm will be available at the corner of St-Paul and Lakeside streets (from noon to 3 p.m.). Cost will be $5 per person (free for children under 5 years old). Take advantage of this ride to see the architecture of our beautiful Victorian village, to visit the merchants, the museum and of course, to go to see the duck farm. Of course, In Knowlton, even when there is a busy festival there is always a quiet place to enjoy a family picnic beside the water. Bring the whole family and enjoy a visit to another time in the Victorian village of Knowlton! When he weather is like this at the end of September the fall colors explode all around the center of the village and stores, terasses and boutiques are all decked out in their sunday best for the occasion. The duck festival is popular amongst visitors who enjoy the fall foliage at the same time as gathering for gourmet treats in the beautiful village of Knowlton. Don't miss your chance to experience one of the best reasons to visit Lac Brome! The 8th Annual Brome Lake Duck Fest also known in French as "Canard en Fete au Lac Brome" is starting on September 20th and the preparations of hard working organizers turning Knowlton village into a huge family oriented street party are sure to make this edition of the succulant festival one of the best ever. 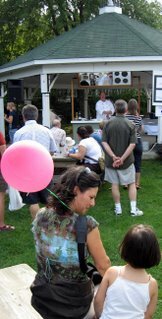 A great variety of regional and local products as well as artists craft, wine, honey, maple vinegar, spices, specialty salts, body products, knitting, moccasins, jewelry, musical instruments, natural products, stone and wooden ducks, Christmas bauble, ice cider, terrines, foie gras, rillettes, alcohols, juices and smoothies, cheeses, dressings, jams, jellies , chocolates, coffee, tea, espresso, hot chocolate, duck tastings, duck wings on BBQ, etc. 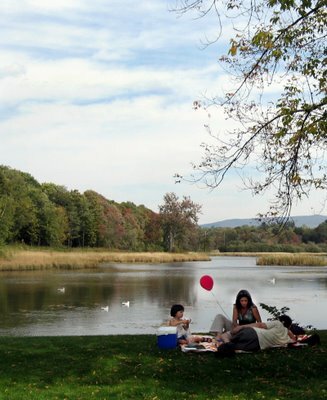 Knowlton, known as one of Quebec’s most beautiful villages, will transform itself over two weekends this fall on September 20-22 and continues the week-end of September 27-29. The hours will be from 11 a.m. to 5 p.m.
Organizers again invited Marie-Andrée Leblond, a local artist, to design this year’s Duck fest poster. 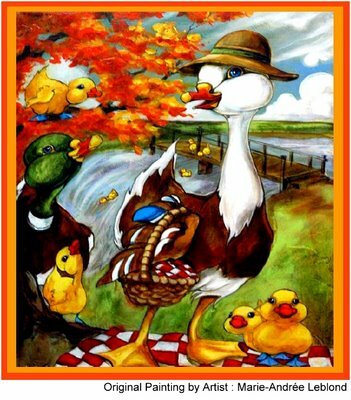 Year after year the talented Artist has delighted us with colorful and fun duck paintings which are loved by all! The poster is sure to become a collector’s item! You can also visit the Knowlton Gallery to see more of Leblonds paintings, the gallery is located right downtown at 285 Knowlton Road, you can't, and shouldn't, miss it! Another highlight is the crazy Duck Race! 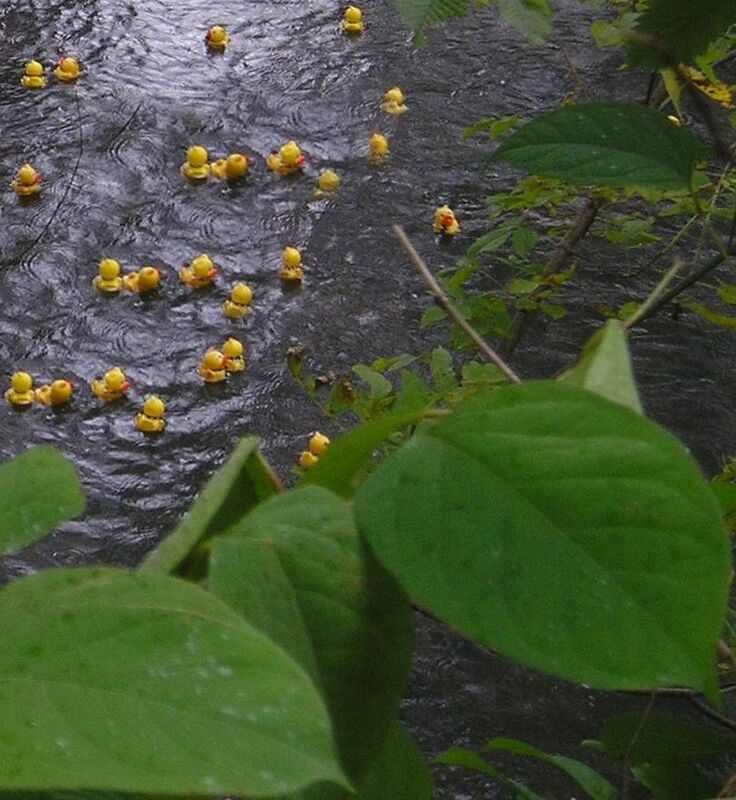 Crowds fill the Park at Mill Pond to watch as thousands of cute yellow ducks pour over the dam and drifted along the Coldbrook in a wild yellow race to the finish line. Kids and adults run through the bushes following the yellow rubber duckies as they bob and weave the easy flowing brook towards the finish line. People cheer, coaxed and holler at the ducks as they float towards the victory net! Relive the magic of previous Great Duck Races! 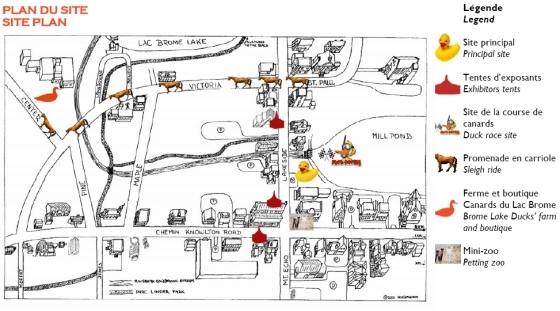 The second edition of Knowlton’s Great Duck Race, organized by the Chamber of Commerce of Brome Lake, will take place on Sunday, September 28 2008. The spectacular Duck release is scheduled for 2:00 p.m. on top of the Blackwood dam of the Millpond at Coldbrook Park. Get their early as the bridge fills up fast with people ready to watch the wild opening of the dam that releases the little duckies! The tickets can be bought at the Chamber’s office at 255-C, Knowlton Rd and at participating stores of Lac-Brome and at the Big Top at the main Festival Grandstand! Death and Rabbits?...OMG Not Rabbits!